As children of God, we often fail to see how great we really are, how among every of God’s creation, we stand out. Rather, we form the judgment of ourselves based on two perspectives. First, how we see ourselves and second, how other people see us. These two perspectives often serve as the platforms on which low self esteem and inferiority complex are built. It’s very easy to see every other thing as better, smarter, more privileged, even greater than ourselves while we wallow within the walls of self pity and the false identity we’ve created for ourselves. insignificant. I lived within wishes and giving low self esteem a chance, it bore deep into me. Against my will, it tamed my voice, crippled my wings, made me a prey to my peers -someone who could just be taken advantage of anytime, it disrupted my social life and made me an object of pity to myself. The day a friend told me that I was letting “the Lion inside of me graze with cattle just because it doesn’t know who it really is…”, I realized it was true. We can either choose the ‘us‘ in the light of God’s word or choose the other ‘us’. Either way, they are interwoven, almost mutually inexclusive. 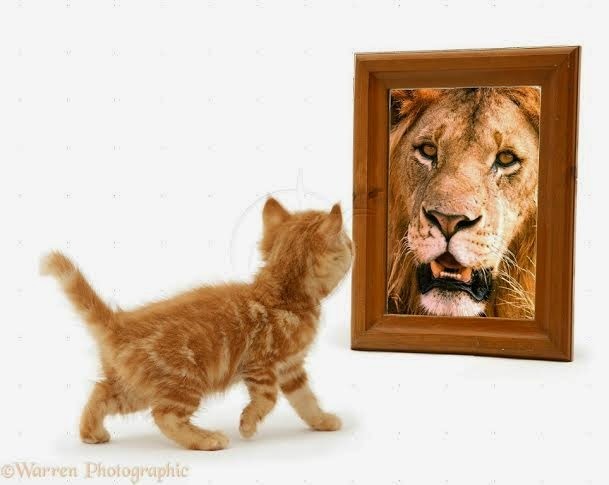 If we discover God’s perspective of us, we consciously align the way we see ourselves to His view and it changes everything, from thoughts to words, from attitude to deeds and from carriage to charisma, including the way others see us, which of course is irrelevant. God put an extra effort into our creation. He didn’t just “word” us into existence like He did the rest. He delicately crafted us, intricately weaved us, planning our lives out before conception. It’s very impossible to remain depressed when you see yourself through God’s eyes. King David knew that too. No wonder he was such a glad fellow. The truth is, there is something really big inside us, really big, it’s almost incomprehensible. Although our physical sizes doesn’t necessarily reflect this. In person, I’m really slim and I really can’t carry a bag of cement but what does that have to do with the things God has deposited inside me? Fela Durotoye described himself as “not the most handsome or the biggest person” in a crowd of 5000 but still, he is who he is. Your physical look has got nothing to do with it. Now, I see myself as the epitome of greatness that I am, like the microorganism seen through a microscope. A wonderful work, perfectly created, marvelously sculpted inside and out, in whom God has deposited so much, irrespective of how I think I look like. No matter what you seem like or who others say you are, know that the you within God’s word is the real you. You are greater than you think. Even mountains know this, for, anytime “you are looking at a mountain, marveling at its beauty and strength, basking in its greatness, realize it is looking right back and admiring you.” Embrace your own greatness.